If There Were No Managers? You talked about the Peter Principle, how at some point everyone in a hierarchy gets promoted to their level of incompetence. I see this as a problem with hierarchy. Get rid of the hierarchy and let people settle in roles where they feel comfortable. One reason you think the problem is hierarchy, you think it exists to create a reporting protocol. Here’s the bad news. You think you are a manager so people can report to you. Not true. You are a manager to bring value to the decision making and problem solving of your team, collectively and individually. If there were no managers, there would be no one with the accountability to bring that value. I hear people rail against hierarchy with tomes about self directed work groups and holocracy. Hierarchy exists for a very specific reason. When the level of work creeps up, hierarchy provides the structure to create that value stream, where managers bring value to the decision making and problem solving of the team. 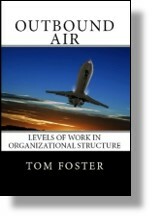 This entry was posted in Accountability, Levels of Work, Time Span and tagged levels of work, promotion, role of a manager, timespan on January 16, 2019 by Tom Foster. When I read this article, I think about Timespan and you. I hope this quote is not accurate. Sadly, this is true. We tend to promote people to a level of incompetence, and then hope and pray. This understanding was popularized in a book by Lawrence J. Peter published in 1969, called the Peter Principle. The Peter Principle is alive and well. The solution to this dilemma is easy. From now on, no one in your organization gets a promotion. They earn promotions (or even lateral moves) by demonstrating competence in the task assignments contained in the new role. You test people with project work. And, in that project, you must embed decision making and problem at that next higher level. The same goes for a lateral move where there is a new skill set. This entry was posted in Accountability, Levels of Work, Time Span and tagged level of work, promotion, timespan on January 14, 2019 by Tom Foster. As a young project manager, Mario was successful at meeting deadlines and holding profit margins on each of the four projects he completed. Paul, his manager, wanted to give him a promotion, but was gun-shy. You don’t test a person by promoting them. Though not impossible, it is difficult to backtrack a promotion. Instead, test a person’s capability by giving them project work, longer timespan projects. Only if they are successful, do they get the corner office. Don’t promote the person to test them. Test them with project work to earn the promotion. This entry was posted in Time Span and tagged project work, promotion, testing on November 7, 2018 by Tom Foster. “But I was here until 10:00 last night. I am working myself to the bone and my company seems to want more. I can’t work any harder.” Victoria was tired. I could see it in her eyes, the hint of a glaze. “What is it that your company wants more of?” I asked. “Well, who is going to do it?” she snapped. “Well, yes, I was supposed to, but there was just never any time to do that,” she said, calming down a bit. “So, when should you have started to train someone to take over?” I inquired. This entry was posted in Accountability, Leadership and tagged promotion, succession, training on May 31, 2017 by Tom Foster. I have a technician in an S-I role, but he shows promise to be a supervisor. Shows promise, he’s not there yet. If I promote him, he will fail. Yet, he is clamoring to be promoted. If I promote him and he fails, he will likely quit OR I will have to fire him. What to do? Your instincts are solid. I divide each stratum level of work into three parts (Lo-Med-Hi). For example, Lo-S-II would be an emerging supervisor, may not have earned the title of supervisor yet, but is still in the learning and testing phase. Med S-II is someone with the competence to be effective in the supervisor role, certainly has the role title. Hi-S-II is someone, extremely competent and a candidate for consideration at Lo-S-III (emerging manager). So, Hi-S-I would be your best technician, could be called at “team lead.” If the S-II supervisor is out for the day, this guy is in charge. He will struggle in most areas as a supervisor, but given time (couple of years) he may grow and become more effective at Lo-S-II accountabilities. Let’s take safety as a key result area (KRA), for example. S-III designs a safety system. S-II selects elements of the safety system to focus on each day, coached by S-III manager who designed the safety system. Hi-S-I may deliver a 3-min safety talk to the team, on a topic selected and coached by the S-II supervisor from the S-III safety system. Hi-S-I would be the role model for the rest of the team to make sure they all go home with fingers and toes. This entry was posted in Accountability, Time Span and tagged levels of work, manager, promotion, supervisor, team lead on January 27, 2017 by Tom Foster. “So, Phillip can handle tasks with a one month time span, but falls short on tasks with a longer time span,” Joyce confirmed. “So, what does that tell you about his role? You told me that you promoted him to Warehouse Manager. Based on the level of work in the role, is that appropriate for Phillip?” I asked. “So, if you had determined the level of work before the promotion, you might have done something differently?” I prompted. “That would be me,” Joyce replied. This entry was posted in Hiring Talent and tagged internal promotion, level of work, promotion on June 10, 2016 by Tom Foster. “Then, how are we going to measure the size of the role?” I repeated. Joyce and I were discussing Phillip. Though he had been made manager, he was having difficulty with some of his new responsibilities. “So, you are suggesting that we look at all the tasks on Phillip’s plate and assign a Time Span to them?” Joyce asked. “And which of those KRAs has the longest Time Span tasks?” I asked. Joyce pulled out a sheet of paper to make some notes. “Receiving, picking and shipping are fairly short term things. The look-ahead is probably no more than a couple of weeks. “But, both Personnel and Warehouse Layout and Work Flow, contain much longer Time Span tasks. We have a lot of seasonality to our product lines and we have to make decisions about inventory bin placement four or five months in advance. We really depend on a twelve month bin cycle that rotates stock both forward and backward depending on seasonality. Some tasks create a feedback loop to sales and purchasing about inventory turns, raw materials in stock, finished goods in stock. There is a lot to control, but it’s easy if you think out far enough into the future and plan. “So, if we were to measure Phillip’s capability in Personnel and Layout and Work Flow, he underperforms?” I confirmed. It was Joyce’s turn to nod. This entry was posted in Hiring Talent and tagged look ahead, manager, promotion, time span on June 9, 2016 by Tom Foster. “You told me, before I promote someone to a new role, that I should test them, with project work,” Maryanne surmised. “So, how will you test this person?” I prodded. “And, what will be the trigger point for the promotion?” I asked. 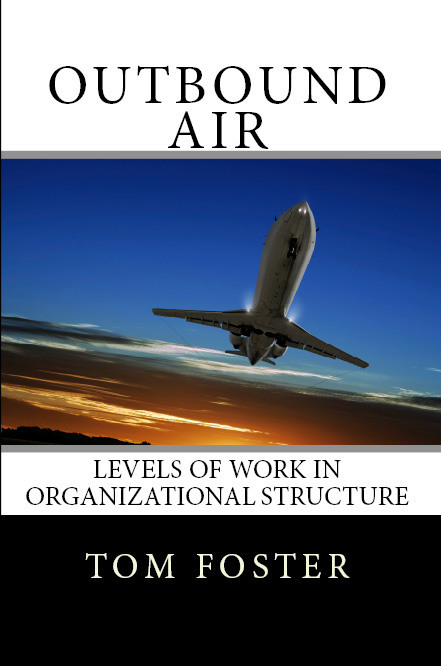 Outbound Air, Levels of Work in Organizational Structure, by Tom Foster, is now available for Kindle, soon to be released in softcover. 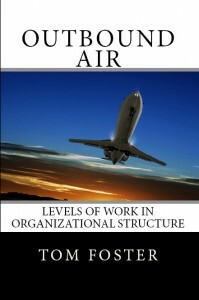 This entry was posted in Accountability, Coaching Skills and tagged manager, Outbound Air, project work, promotion on April 29, 2015 by Tom Foster. “You have a hunch, let’s call it intuitive judgment, that this team member might be effective at a higher level of work. You observe evidence of that potential in current projects, and in the pace and quality of current work output. She is helpful to other people she works with and coordinates her work handoffs so they are seamless. So, what is your question?” I asked. “There is an open position. I think I would like to promote her,” Maryanne shrugged her shoulders. “So, if you promote her, and it doesn’t work out, what do you have on your hands?” I pressed. This entry was posted in Accountability and tagged manager, promotion on April 27, 2015 by Tom Foster. Should I Promote Based on a Hunch? “It’s just a hunch,” she replied. “Okay. I know you want me to slow down,” she agreed. “So, tell me. What evidence of potential do you see?” I repeated. This entry was posted in Accountability and tagged manager, promotion on April 22, 2015 by Tom Foster.